Solar power typically refers to the production of electricity from light given off by the sun. The most common instance of this is the use of photovoltaic cells in solar panels, which have been employed on the small-scale (e.g. solar-powered calculators) and large-scale (e.g. solar power plants, orbiting artificial satellites). Solar power is a renewable energy source, in contrast with fossil fuels. Solar power production via photovoltaic cells typically produces a less efficient conversion of energy into electricity compared to power production from the burning of fossil fuels, but with the abundance of solar rations available to Earth, this limited efficiency is normally inconsequential. The main drawback to using solar power as a principle energy source is the inability to provide baseload power throughout the day and night: the sun cannot be guaranteed to shine every day, power is still in demand after the setting of the sun, and some areas of the world do not receive enough consistent sunlight to rely on solar power as a main energy source. Thus, solar power will, at least in the foreseeable future, not become a principle part of the world's energy production but may still be very useful in supplementing power demands in some parts of the world. Employment of small solar power arrays in areas that are rarely overcast (e.g. the American southwest) may allow some businesses to cheaply produce products and chemicals that require large electrical demand (e.g. the production of extremely pure hydrogen and oxygen from the electrolysis of water). Grid parity refers to the point where power provided by solar panels (photovoltaic solar) is at the same or lower price of conventional power sources such as coal, natural gas or nuclear. The price per watt of installed solar has been steadily falling while the price of other energy sources including wind power has been steadily rising. A historic crossover with nuclear power occurred in 2010. In regions with adequate sun exposure electricity can now be produced at a lower cost per kWh with PV solar than with nuclear power. The price for a DIY residential grid-tie solar system can be as low as $2.50/w (2011), before subsidies or tax credits. At this price the system would pay for itself in ~12 years, many utilities offer incentives that can lower payback to <4 years. Most systems carry a 25-30 year warranty. Due to the fact that most solar power is produced when electric demand is highest, between 3pm - 7pm many utilities actually benefit from paying their customers to install solar panels since most districts do not charge peak rates. 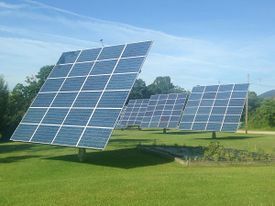 It can cost a major utility as much as $.50/kwh during peak demand while solar production credits are usually ~$.20/kwh. Roof-top PV can be extremely cost-effective since no land needs to be purchased. Conventional sources of power generation are concentrated in power plants that range from 100MW to 1000MW. Distributed Generation is the grid-tied production of electricity from smaller generators typically less than 100 kW. Solar Power is an ideal source of energy for distributed generation. Most residential rooftops are capable of supporting at least 3 kW of solar panels while many commercial warehouses can support several MW of solar PV. In sunny regions of the United States, this is adequate to provide >50% of the electricity requirements for the average US household. One major advantage to distributed generation is that it is consumed very close to where it is produced, this decreases the stress on America's electric grid which is already operating near capacity. Germany is an example of how effective distributed generation can be adding 7 GW of solar power in 2010 alone, this is more electricity than is produced by a nuclear power plant. Solar power often provides >10% of electricity in Germany during the day and doubled in capacity from 2009 to 2010. Renewables accounted for more than 50% of the world’s additional electricity capacity in 2015. Despite lower fossil fuel prices and thanks to government support, costs for wind and solar continue to fall. Solar Star 579-megawatt solar installation in Kern and Los Angeles counties in California. Delivers enough electricity to power the equivalent of approximately 255,000 homes. Topaz Solar Farm 550-megawatt solar farm located on the northwestern corner of the Carrisa Plains, produces sufficient electricity to power 160,000 average California homes. Copper Mountain Solar 458-megawatt solar farm located in Boulder City, Nevada. Desert Sunlight Solar Farm 550-megawatt solar farm located at Desert Center, California provides enough renewable energy to power more than 160,000 homes in Riverside County. Mesquite Solar Complex 400-megawatt solar farm located at Tonopah Arizona provides power to U.S. Navy and Marine Corps bases in California. Desert Stateline Solar Facility 300MW solar farm located at San Bernadino County, California. Springbok 1 and 2 228 MW solar farms located in Kern County, California. A third facility is nearing completion. Agua Caliente Solar Project 290 MW photovoltaic power station located in Yuma County, Arizona. Antelope Valley Solar Ranch 266 MW photovoltaic power plant near Lancaster within Antelope Valley, California. Mount Signal Solar 266 MW photovoltaic power station near Calexico, California. Silver State South Solar Project 250 MW photovoltaic power station in Primm Nevada. California Valley Solar Ranch 250 MW photovoltaic power plant in the Carrizo Plain, California. Moapa Southern Paiute Solar Project 250 MW solar project located on the Moapa River Indian Reservation in Nevada. Liberals often point to solar power as a way to "solve" global warming. This has several problems. Other than the fact that the claim of global warming is dubious, solar power is not very efficient, giving much less energy than oil. Many liberals have tried to force solar power onto many areas, despite the fact that it would be very costly and would be much more inefficient than oil, for example. This page was last modified on 21 August 2017, at 21:34.